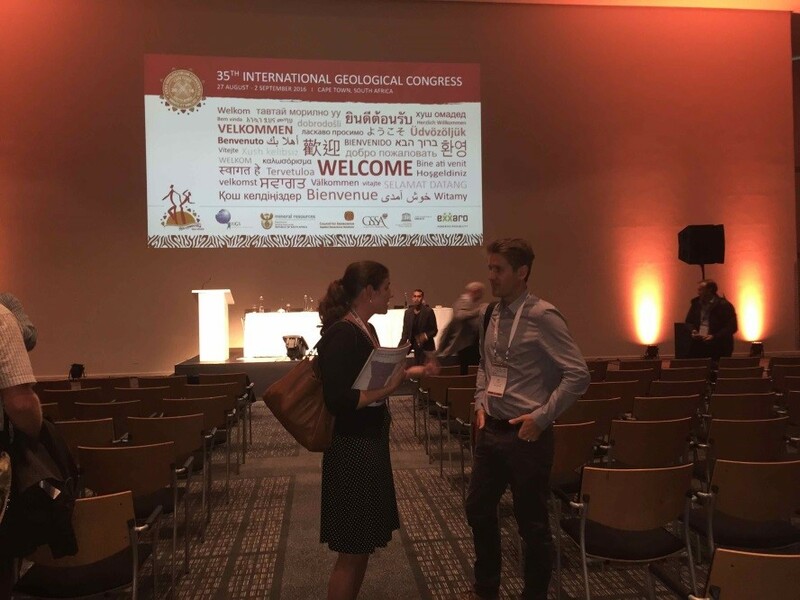 In August 2016 I set off for the amazing Cape Town (Photo 1, above), South Africa, to attend the 35th International Geological Congress (http://www.35igc.org/). 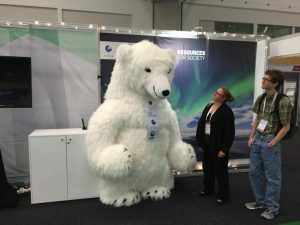 This is one of the largest and most important geoscience conferences in the world that takes place every 4 years. This prestigious meeting has taken place in the African subcontinent only once before, in its inaugural year 1929 in Pretoria, South Africa. Photo 2. 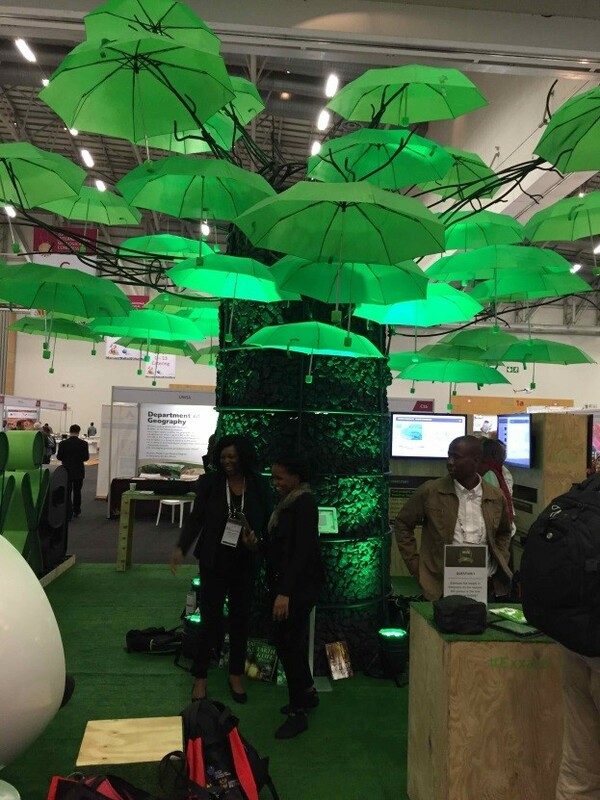 South African mining company’s interesting display of green umbrellas signifying a tree. The largest sponsor of the meeting is the International Union of Geological Sciences, which is a 121-country member organisation set up in 1961 and is devoted to the international cooperation of geology. The 35th IGC consisted of 50 themes ranging from Engineering Geology and Remote Sensing technologies, to Isotope Geoscience and the Geological Time Scale. 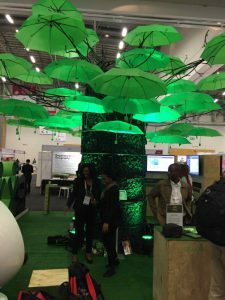 It also included many booths for industry (Photos 2), research organisations (Photos 3) and others. I gave my talk entitled “Oceanographic and climate changes during the Mid Pleistocene uncovered from Bering Sea and Pacific Ocean sediment cores”, which was presented at the session on “Marine Geosciences and Oceanography” on Tuesday 30th August (Photo 4). My talk focussed on ocean sediment geochemical work funded by the Natural Environment Research Council, and new findings that address the changes in ocean stratification over the Mid-Pleistocene Transition. 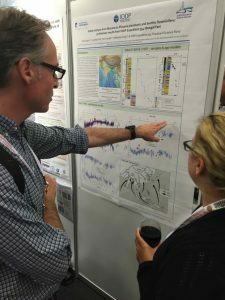 This session was heavily represented by the International Ocean Discovery Program (IODP), which is the largest international scientific collaboration in history, and cores the deep ocean for scientific research and discovery every year. 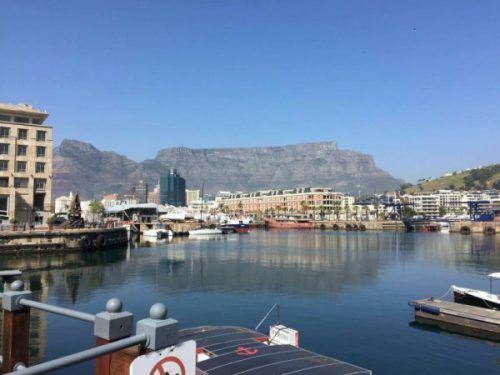 One of the talks was aimed at trying to encourage South Africa to become a member of IODP so that scientists there can take part in future expeditions. Photo 3. 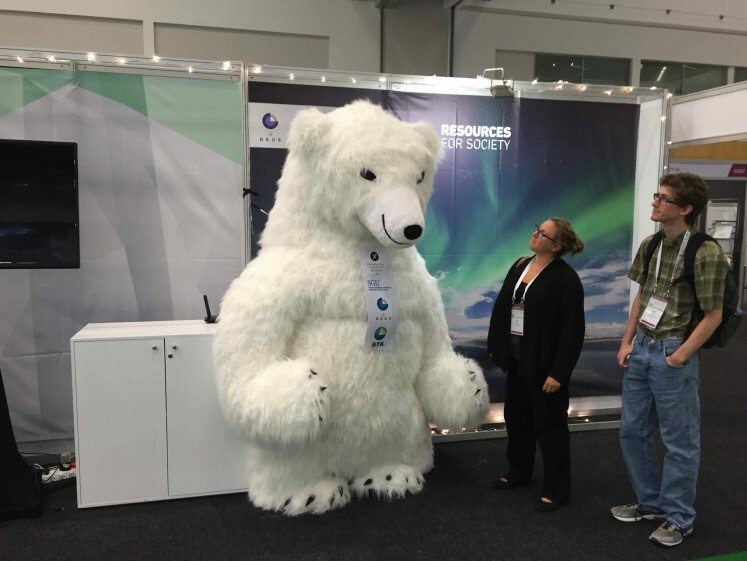 A giant fluffy polar bear, representing the Danish Geological Survey, is admired by Kara Bogus and Evan O’Brien. I was also a co-author on a poster in this session, which was presented by Kara Bogus on the NERC-funded project work she carried out at the University of Nottingham in 2016. This was entitled “Stable isotopes from planktonic and benthic foraminifera: preliminary results from IODP Expedition 354 (Bengal Fan)” (Photo 5). The IGC was notable for its multiculturalism – this was apparent at the conference dinner. The dinner featured six different buffets including traditional African food, South African braai, Indian curries and Dutch inspired dishes. Judging by the crowds at each buffet, the food was a big hit. Also a big hit was the evening entertainment, which featured a local township band and their lead singer Fancy Galada. Their fantastic performance had everyone out on the dance floor and most participated in a massive conga line. Photo 4. Me (Sev Kender) chatting to participant after my talk on IODP work. Photo 5. Kara Bogus presenting her poster on IODP work.